Like many masterpieces of horror, what makes The Passage one of the finest pieces of vampire literature to come along in a long, long time is that it’s not about the monsters. So much time is invested into building the pre-bloodsucker world that when the creatures rise up, their presence is both fully formed and yet somewhat secondary. Though entirely its own story, this first volume in Justin Cronin’s planned vampire trilogy is easily comparable to The Stand, both in plot and scope. The first act of the tale is set in a United States a few years from now, in a world which has fallen further into the war on terror. Further acts of mass destruction, committed both inside the country and beyond, have turned America into an ailing police state. Such a declining state of affairs leads to drastic attempts to reassert American dominance, culminating with a plot to copyright immortality. You can guess how well that turns out. A hundred years later, mankind is in its death throes, when a girl from the old world reappears to lead a band of survivors to war. Their present goal: to travel to ground zero and find the truth about the walking plague. 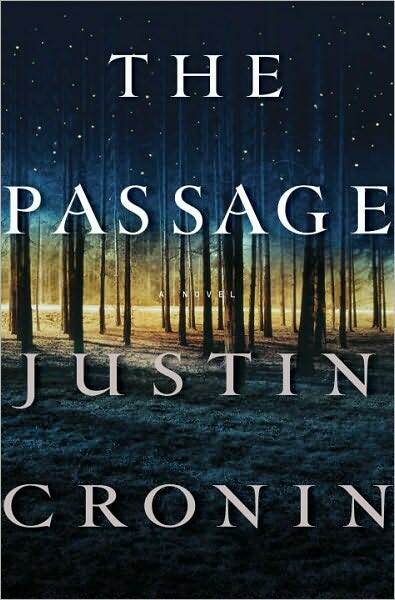 The main facet of Justin Cronin’s storytelling that sets him apart is his eagerness to infuse his story with consequence. Too many characters come back when presumed lost, and this does pull the plot into an undue tidiness at times. That some documents of the times have been preserved as exhibits in a society a thousand years in the future indicates that some form of civilization has survived, which takes away some of the danger. Then again, Cronin is unafraid to wipe out anyone and everyone, and there’s a lot that could happen in the next millenium. Despite the hazy future, the suspense in The Passage twists the reader’s expectations right to the very last sentence. All of which wouldn’t mean a thing if the characters weren’t so well developed. The people of the old world and the new – both the monsters and their prey – are examined without mercy. Their flaws are brought into full view, yet at the same time no character, no matter how vile, is without humanity, and one can fully understand where each person is coming from. The board is black and white, but the pieces are all shades of grey. The sum total of The Passage is a story that may not reinvent the wheel, but is fully deserving of being called an epic. If this first offering is any indication of how the rest of Cronin’s trilogy will unfold, this will be the vampire story by which all others will be judged.